The Toledo to Chicago Canal. A Dream Never Dug. Toledo’s past and future could have changed dramatically. Once upon a time in America, some dreamers and visionaries had a plan. A plan that would have dramatically changed Toledo’s destiny. Be it for the better or for the worse may be a tough call in hindsight, but certainly our history of our city would have been profoundly rewritten had this ever become a reality. The plan was pretty simple. To build a major shipping canal from Toledo to Chicago. Unlike the Miami-Erie-Wabash canal system that was created in the 1840’s than ran parallel to the Maumee River, and laced itself through the Midwest, this one would have actually used much of the river itself as the canal channel and would have run across the landscape of Northern Indiana or southern Michigan. It would have been large enough to have allowed the passage of larger ships, hauling massive cargoes to back and forth between Toledo and Chicago. To those who advocated this dream, it was a no-brainer. The prevailing school of of thought was to eliminate the long journey for the thousands of Great Lakes cargo ships that had to travel around the state of Michigan, via the Detroit River, Lake Huron, the tricky Straights of Mackinaw, and southward down Lake Michigan to if they wanted to reach Chicago. With a navigable shortcut across Ohio and Indiana, more than 400 miles and a three to five days could be cut from the travel time, thus a savings of of time and money. Toledo, geographically, would have become the gateway to the West..and the busiest port on the Great Lakes. It should be noted that this canal plan was not just some idle talk from wild-eyed dreamers without resource or reason. It had been a topic of serious merit for decades in the 19th Century, and by 1908, the plan had the eyes and ears of Congress and the Congressional Committee on Rail and Waterways was strongly recommending that the shipping canal become a reality. In that committee’s report to congress in 1908, it said that such a Toledo to Chicago Canal, would.. The committee also believed that such a major shipping channel would open the door for revival of the canal system through the Midwest and more and larger shipping channels could be built between the Great Lakes and the Ohio River. It was also the aim of many promoters to use these canals to compete with the railroad roads and keep their rates competitive. Had this canal actually come to fruition, it would not stretch anyone imagination to think that Toledo could have easily rivaled Chicago, or Detroit, for size and economic power on the Great Lakes and the Midwest. Other towns along the route, may have actually had their futures changed, as they became “seaport” communities in the middle of a largely agricultural region. The 1908 committee also predicted. The report goes on to estimate the cost of construction at about 100 million dollars, and that water generating stations could be built along its path capable of generating as much a 16 million dollars a year in power. More than enough to pay down the debt and the interest. Scene from early canal days in Toledo. As mentioned before, this idea of the Lake Erie to Lake Michigan canal was hardly new in 1908. The Erie Canal through New York State many decades before had ignited the fires of imagination around the country as others wonder if they too could pull off such an engineering feat. In 1837, some ambitious Michiganders got the canal fever and even started digging a big ditch from Clinton township north of Detroit that was to extend Westward to Lake Michigan. By 1840, however, with only 16 miles complete and deeply in debt, the Clinton-Kalamazoo Canal became a footnote in history. But hope springs eternal and in 1857, the New York legislature voted to grant a charter to company to explore and pursue the concept again. The newspapers in both Buffalo and Detroit were especially warm to the idea, as these new plans would have placed the Eastern portal of the canal between Monroe and Toledo, routing most of the channel through southern Michigan. The Buffalo Advertiser even speculated on the dimensions of such a ditch, allowing that it could be 100 feet wide, 12 feet deep and 160 miles long. They also addressed the elevation change between the lakes, by proposing at least “two locks” that could lift the boats. 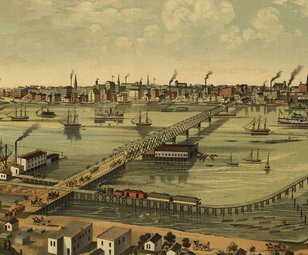 The Buffalo newspaper estimated the cost of construction at $65,000 a mile, or about $12 million for construction overall in 1857. But while Buffalo, Detroit and Toledo talked in glowing terms of such a project, in Chicago, not so much. The editors at the Chicago Tribune were not impressed. Clearly not in favor of such a plan, they railed against it, and called the idea “impractical” while challenging the estimates of construction costs, the potential savings to shipping companies, and also questioned whether there was ample water supply to fill such a canal. Six decades later, in 1917, as the U.S. was distracted with the war in Europe, the Army Corps of Engineers also did another study and they would would essentially come to the same conclusion as the Chicago Tribune did in 1857. Given the costs and time required to build it, they said, and because such a canal would not be able to accommodate large ships, but only smaller packet barges, they wrote: ”It is not advisable to undertake the construction of an artificial waterway between Lake Erie and Lake Michigan.” The Corps even recommended that the government not waste any more money and put a halt to more studies. 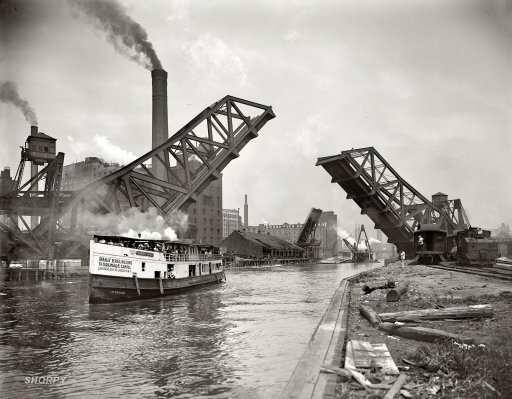 The Toledo to Chicago canal idea rose again from dormancy the in the 1920’s. Some of the proponents once more began to talk optimistically about a Toledo to Chicago shipping highway. One of those voices was that of former Iowa Governor, William Harding, (not to be confused with Ohio Governor Warren Harding). When Iowa’s Harding was President of the Great Lakes -Seaway Waterway Initiative in 1923, he visited Defiance Ohio on the Maumee. There he told a gathered audience that he believed the Maumee River to Chicago water link would someday become a reality. It was his belief that such a project would come about only after the St. Lawrence Seaway project was complete and the shipping industry would demand it within a few years. He even predicated that Toledo would be the greatest shipping port in the nation and a docking facility along the Maumee might well extend “all the way to Defiance”. Well, Mr. Harding’s hyperbole was perhaps as hyper as his crystal ball was cracked. The Seaway linkage to the Great Lakes did not open for another 35 years, not until 1958. Five decades later, still no canal. Albeit, over the years, plenty of talk about one. During the WW Two era, it crept back into the headlines again as the Army Corps re-considered it with “national defense” as a justification. This plan did gain some traction and even won the approval of President Roosevelt just weeks before his death. But in the summer of 1945, as hearings were held and the war drew to a close, the grand canal plan was again ditched as unfeasible and too expensive. But big dreams don’t die quickly. They always linger of the deathbed of possibility for a long time. As late as 1968, hearings were underway to consider, a new network of canals and locks that would have linked Toledo and Chicago with other cities in Indiana and the Ohio River. A 450 mile system, requiring dozens of locks, and costing over a billion dollars that was primarily designed to improve the economies of rural Indiana. By then, however, the concept of the “big ditch” was viewed by many corners of the community as a big “folly”. Opposition from conservation groups, an early environmentalists was loud and hard to ignore. No one seemed to be in favor of the proposal and so this too, like the first big canal dig in Michigan of 1838, was to be filled in and forgotten. Forever? Who know where and when future dreams arise?